We're taking it as a compliment and indication of this here site's influence and esteemed readership that the Metropolitan Police Authority are emailing us asking for help in publicising their consultation on future policing priorities. what are your top three priorities for policing in London ? why do you choose these priorities? what should the Metropolitan Police Service be doing to tackle these priorities? We're conscious that these questions are pretty difficult to answer and we're personally avoiding a flippant response that makes mention of knife crime chocolate babies, filling in expenses forms correctly and suggesting ingenious ways of tackling tinny music speakerphone crime on public transport. Please have a think and take a few minutes to complete the survey online here. 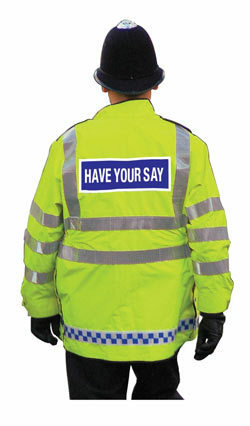 Have your say on policing our city.